The region is renowned for its foie gras, truffles, saffron and walnuts. Duck dishes, such as magrets de canard (duck breast) or confit de canard (duck simmered and then preserved in its own fat) appear frequently on local menus, as do salads with warmed cabecou cheese and Quercy lamb. Truffles are considered the “Black Diamonds” of France. 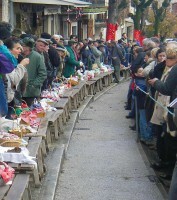 The largest truffle market in SW France is 20 miles away in a traditional open-air maarket in Lalbenque. Held every Tuesday between December 1st and March 31st, it is quite a scene, complete with strollong gendarmes, red checked cloths and much secrecy. Warm rounds of soft, goats’ milk cheese called “Cabecou” are often used to make one of the most mouth-watering salads you have ever tasted. The chef? ?places the? ?cheese on top of soft, organic, field greens which are dressed with vinaigrette, then drizzles honey a tiny bit of over the cheese. You can buy Cabecou in any market and make the same salad yourself… or spread the mild white cheese on warm bread, instead of butter. It also can be used as shown below, with roasted eggplant, peppers and arugla. Delicious! Walnuts abound in every menu. Vin de Noix or walnut liqueur is part of the famous, often homeade, aperitif called Fenelon (made with Cahors Malbec wine, and equal parts of Creme de Cassis and Vin de Noix added). After mixing, it must laid down to rest for a year or so. You will be able to find it, and the base to make it, for sale in the Musee du Vin. Ask Emilie. 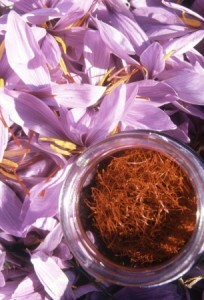 Saffron’s aroma is often described by connoisseurs as reminiscent of metallic honey with grassy or hay-like notes, while its taste has also been noted as hay-like and sweet. Saffron also contributes a luminous yellow-orange colouring to foods. It is? ?the most priceless spice in the world, as each thread must be hand harvested from the crocus flower and each flower only contains a few threads. The saffron produced in SW France is considered of a “boutique variety.” Often used to flavor rice, the spice is shown below with regional figs.